Our goal is to help preserve as many of the endangered heritage breeds as we can. This is just one reason we chose Chocolate Turkeys. 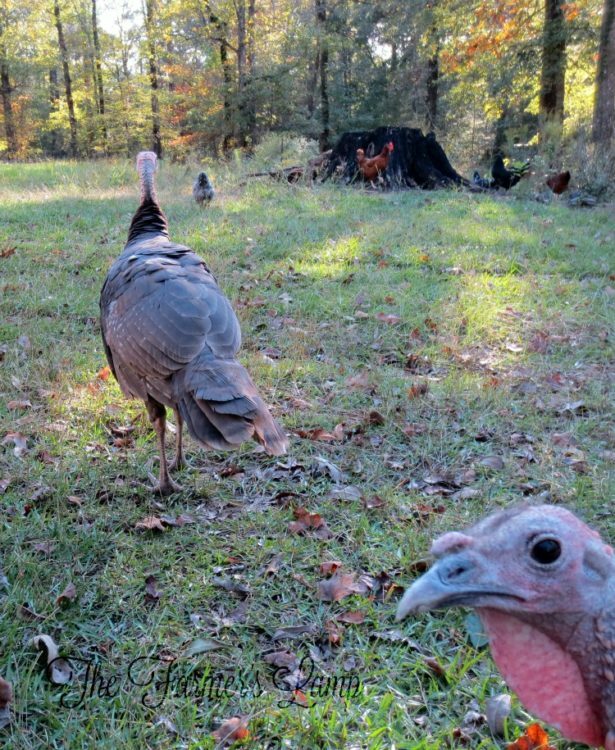 Because we focus on raising endangered heritage breed livestock, we went to The Livestock Conservancy’s website to research heritage turkey breeds. 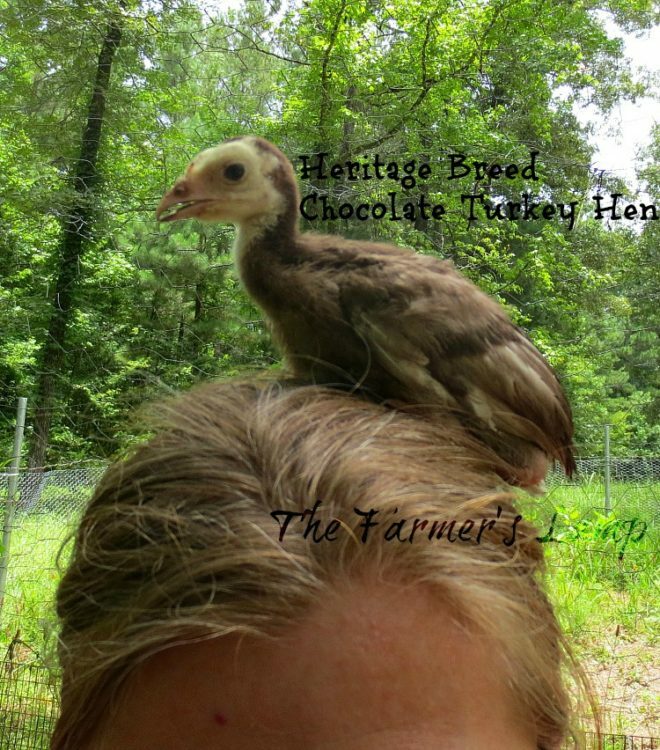 We raise heritage breed chickens, so adding heritage breed turkeys seemed the natural thing to do. 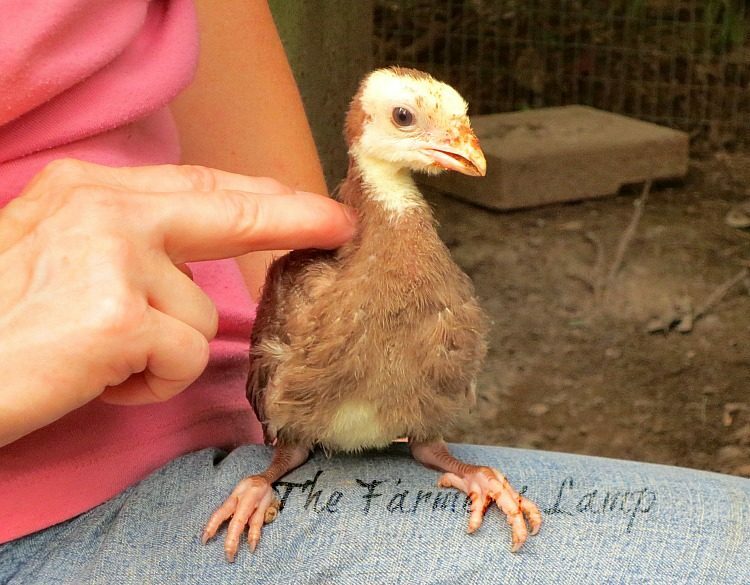 Raising turkeys is more challenging than raising any other poultry. We didn’t choose Chocolate Turkeys because they’re made of chocolate, which would be a good reason indeed. Our reasons were more personal. 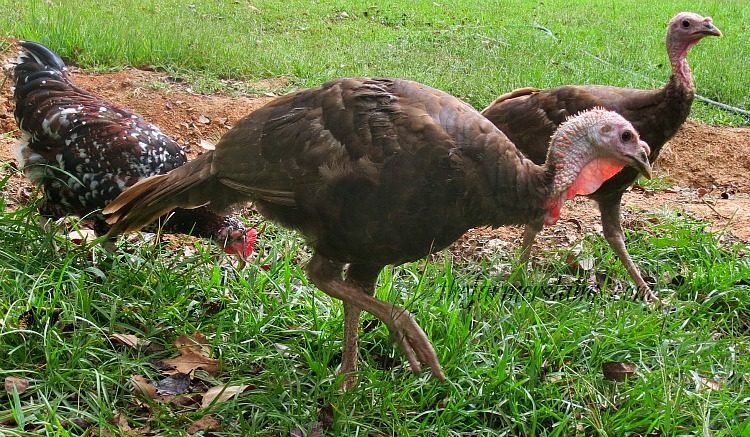 Before the Civil War, the Chocolate Turkey was the turkey breed of choice in the south. This was especially so in our old stomping grounds of West Central Louisiana and Central Mississipi. Because food became scarce the turkeys were eaten, killed in battle, and their breeders were lost to the war. This created devasting destruction for the breed. Even now, they’re still on the “Critical” list with the ALBC. 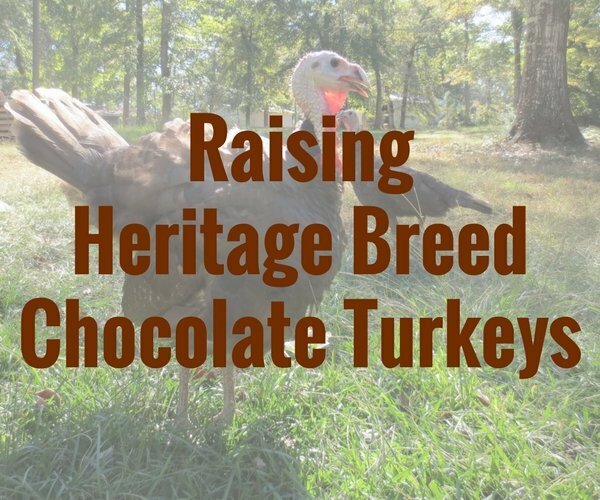 Most of today’s Chocolate Turkey flocks have some Bronze, Bourbon Red, or Narragansett in their DNA due to the decimation of the breed. This doesn’t mean they aren’t a heritage breed according to The Livestock Conservancy which accepts them as a true heritage breed even though the APA doesn’t accept them as a pure breed. I’m sure you already guessed their name, “Chocolate”, comes from the color of their feathers, shanks, and feet. They are all three a solid milk chocolate color when the bird is mature. Even though they’re considered the largest of the heritage turkey breeds, they’re known for their gentle nature. One of the things I like about turkeys, don’t get upset with me, better than chickens is they imprint with their people much like geese do. I have a friend I call Mother Goose because of the strong bond her geese have with her. Our Chocolates imprinted with me and enjoyed turkey conversations. We were also attracted to the chocolate turkey because they produce more meat than most of the other heritage breeds. A mature tom averages 33 pounds while the hen averages a mature weight of 18 pounds. They’re dressed weight is 24 to 28 pounds for the tom and 14 to 16 pounds for the hen. The hens are also excellent mothers which make preserving the breed on the farmstead practical. According to the ALBC, a heritage breed must meet 3 qualifications. They must breed naturally. We all understand what this means. It’s interesting to note a heritage breed turkey must have naturally mated grandparents and parents. They must be able to endure a lengthy, natural, outdoor reproduction system. A breeding hen is productive for 5 to 7 years on average. A breeding Tom is productive for 3 to 5 years on average. They must have a slow growth rate. It takes a heritage breed turkey 28 weeks to reach its marketable weight. The slow growth rate gives them time to develop their skeletal system and internal organs so they can handle the weight of their muscle mass. Once we ordered the poults, I tried looking for information to see if I needed to do anything different for them from chicks. I was shocked to see there simply isn’t a great deal of information available. Since they are more fragile than chicks, I wanted to be prepared. Maybe I’ll write a book on it! I was able to determine the temperature needs to be 5-10 degrees warmer than it does for chicks the first couple of weeks. It’s also better for them to have their food and water elevated to neck level. Other than these two small differences, they are brooded pretty much the same as chicks. We ordered 15 Chocolate Turkey poults. Three died within the first two days. The stress of shipment and shipment injuries killed them. 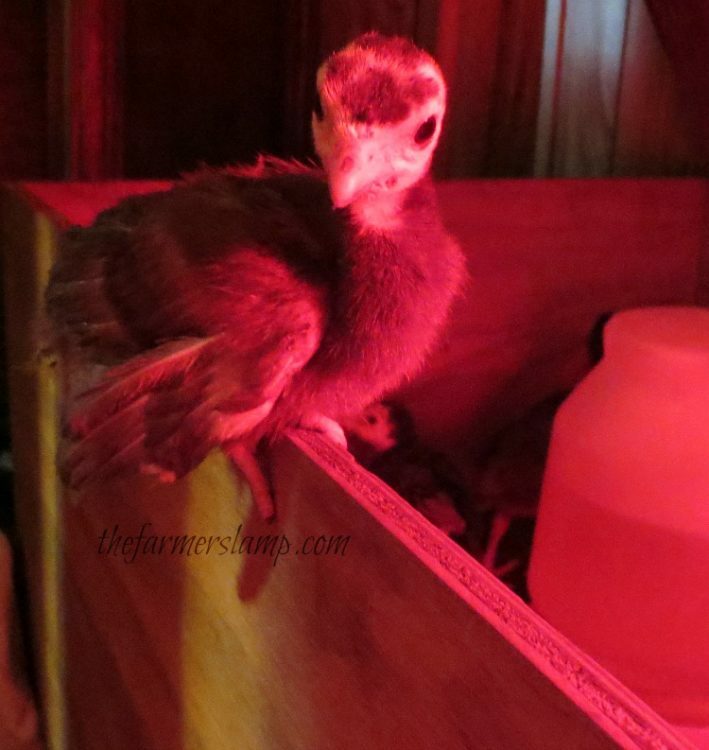 By the 7th day, I had lost 5 more poults to respiratory problems due to shipment stress. This is why I will change the way I purchase any new bird for our farm. You can read more about it in Caring For Mail Order Chicks. I was sick at heart but determined to do all I could for the remaining 7. They made it to the outside in what I thought was a healthy state, then it happened. I had an excruciating experience with the turkey poults. One I’ve never had in 30+ years of poultry keeping or since. It was the dastardly disease, coccidiosis. We lost 5 turkey poults to this disease. I learned a great deal from the experience. Of the 15 we ordered, we had a healthy 16-week old tom, Cocoa Roo, and a hen, Crazy Cora. When you have turkeys, you’re never bored. When they’re learning to fly, they would fly over the fence on accident. Oh! You’ve never heard such commotion like when they’re separated. I was always running out to catch and “rescue” whomever was over the fence. Once they learn to fly, it’s no holds barred. Turkeys come and go as they please unless you have a covered pen. You’ll fall in love with these birds every day. 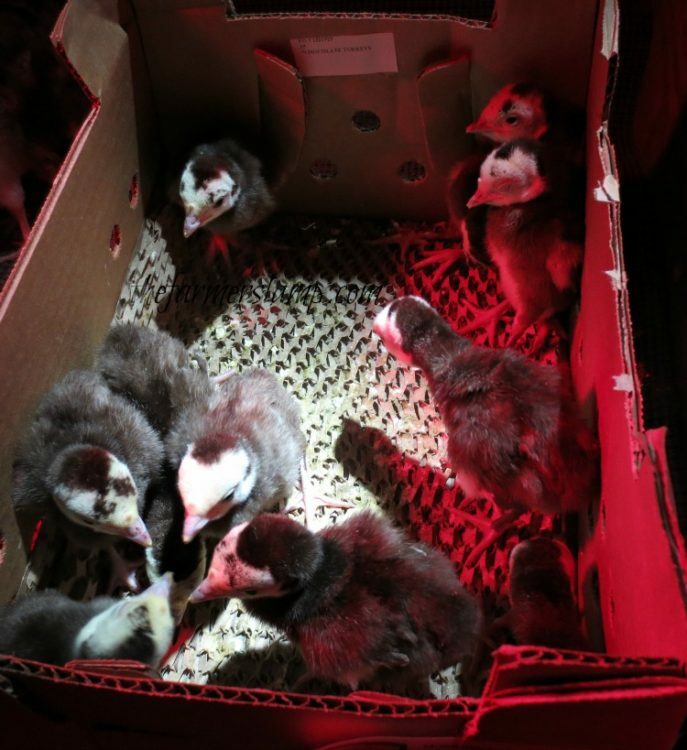 We had 15 Speckled Sussex chicks arrive three days before the Chocolate Turkey poults. There are some notable differences in chicks and poults. Turkeys are slower to learn to eat and drink. With chicks, you dip their beaks once or twice and they’ve got it. I had to show the turkeys how and where several times before they began eating and drinking on their own. Turkeys are extremely sensitive to environmental changes when poults. When you’re cleaning out the brooder or even their yard they let you know they’re not happy about it. If you move the food or water, you have to show them where you moved it to a couple of times. Any change in temperature, sound, or light will be precipitated by them letting you know they aren’t happy about it. Once they get around 6-8 weeks old, they are resilient and inquisitive. Poults are much more inquisitive than chicks and become attached to their humans. You’ll notice this from about 3 weeks of age. At around this same time, they’ll start perching and roosting. I was amazed at their instinct and ability to flutter and perch at such a young age. They are louder and more vocal than the chicks. 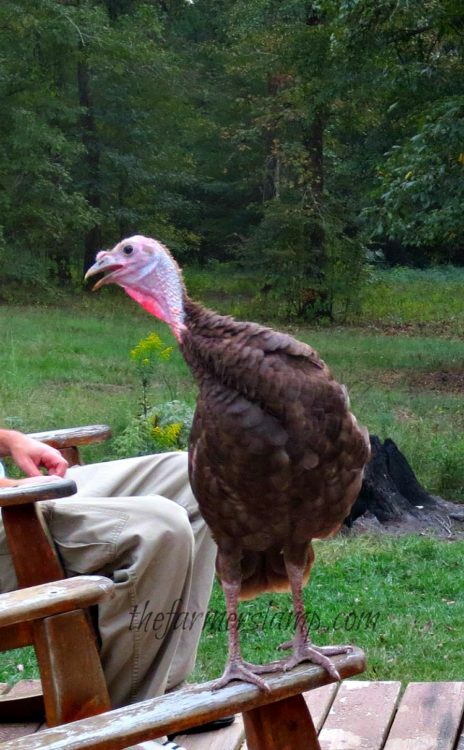 Turkeys want to talk to you, sometimes for extended periods of time. If you’re outside and don’t acknowledge them, they’ll get louder and louder until you do! 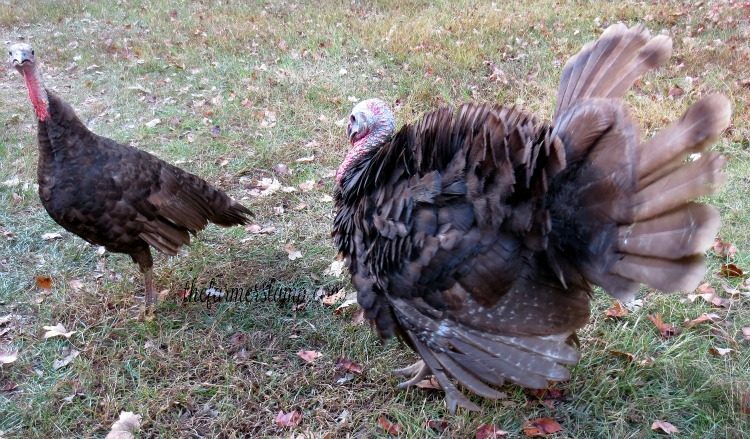 I read that turkeys are kind of “simple minded, almost stupid.” I believe this may be true of domestic turkey breeds, commonly called commercial breeds, but not heritage breeds. Chocolates are smart, independent thinking birds. While they free range with the chickens, roost with them, and eat with them, they seem to know they’re different. You’ll notice they will almost always flock together, like birds of a feather! Couldn’t resist. If one flys up or out, it will call to the others until they join them or until the calling one gives up and joins the others. They are so funny. Toms like to “boss” the hens by strutting and gobbling, in his best big boy voice. She likes to ignore him. The tom will begin practicing his strutting as early as 6 weeks of age, but by 9 weeks, he’s ready to strut his stuff. The first time I saw it I squealed with joy causing him to stop immediately. Around 13 weeks of age they begin perfecting their grownup gobbling and other communication techniques. Turkeys pretty much do what they want to do. If the gates are closed and they want to free range, they simply fly over. When it’s time to go to roost, they may be on the roost, they may not. I believe this goes back to their instincts which tells them to roost up high at the end of the day wherever they may happen to be. After they were about 20 weeks old, she would go to roost in their turkey tower my husband built for them. Sometimes he would be there, but usually not until after some coaxing. He knew where we wanted him, he just didn’t want to do it unless I made him. The main reason you’d want them to roost in a particular area is so the hen will feel safe in the coop so she’ll lay in her nest. You don’t want to have an egg hunt to find her laying spot. Turkeys are very good at hiding. Turkey hens begin laying later than chicken hens. She won’t begin laying until she is about 8 months old. She also won’t lay as often as a chicken. Heritage breed hens will lay an egg every 3-5 days. On average 100 – 150 eggs a year. We are sustenance farmers, which means we provide food for ouselves from our livestock. They are not our pets. A lesson we carry on from my grandparents it that if it is meant for the table, it doesn’t get a name. We’ll eat those birds not chosen for breeding purposes. Building a sustainable breeding flock of heritage turkeys takes time. You have to be selective in which birds are kept for breeding. You only want the strongest, healthiest, most productive birds to keep the flock alive. 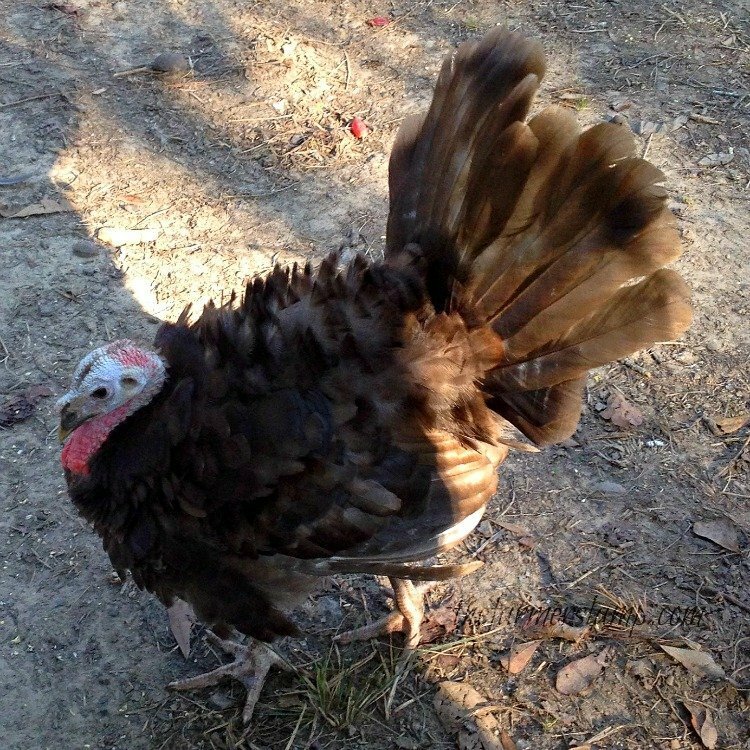 Do you raise heritage breed turkeys? Do you have a favorite breed? I’m sure you know by now, our favorite breed is the Chocolate turkey.